You may wish to see an introductory page to this section or the initial page on Topkapi Sarayi first. The third courtyard housed the palace school for pages, the sultan's apartments and his treasury. It was entered through the Gate of Felicity which was guarded by the eunuchs. 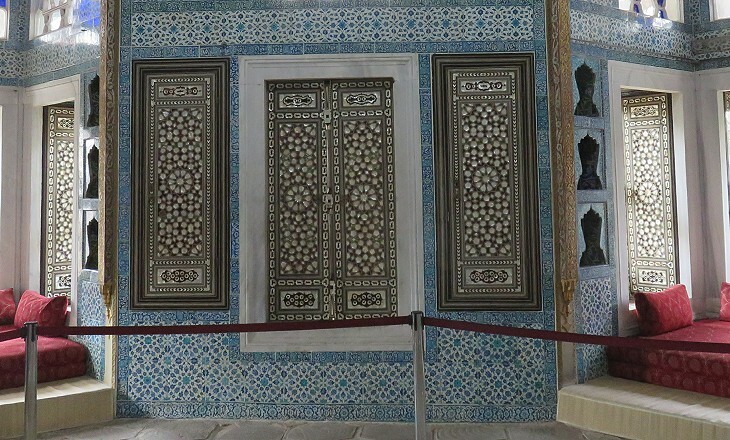 The Sultan met the members of the Divan every day in a large hall located immediately behind the gate. 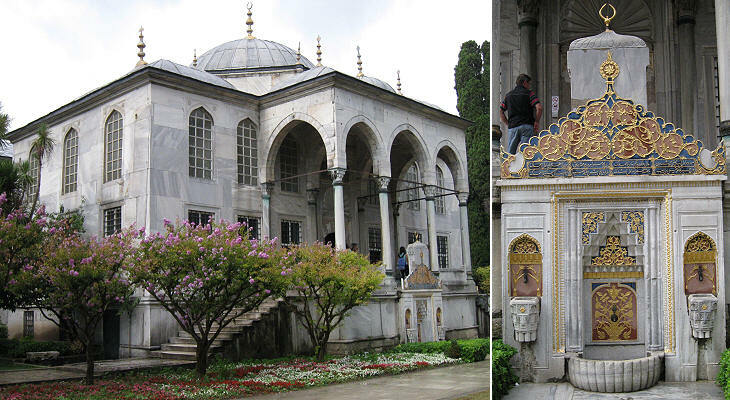 An elegant small building stands at the centre of the third courtyard; it is the library of Sultan Ahmet III, who introduced to Constantinople the first printing press in Arabic. Its design follows traditional Ottoman patterns. On the back of the building there is a small fountain with a very elaborate decoration (which you can also see in the image used as background for this page). The buildings on the southern part of the courtyard house a permanent exhibition of the Sultan's Treasury. The last courtyard is actually a garden with pavilions placed here and there. Two very fine buildings are located at its north-eastern corner: the Circumcision Room and the Revan Pavilion. The former was close to the entrance to the Harem. The Revan Pavilion was built in 1636 to celebrate the conquest of today's Yerevan, the capital of the Republic of Armenia. The region was part of the Ottoman Empire, but it was lost to the Persians at the beginning of the XVIIth century. 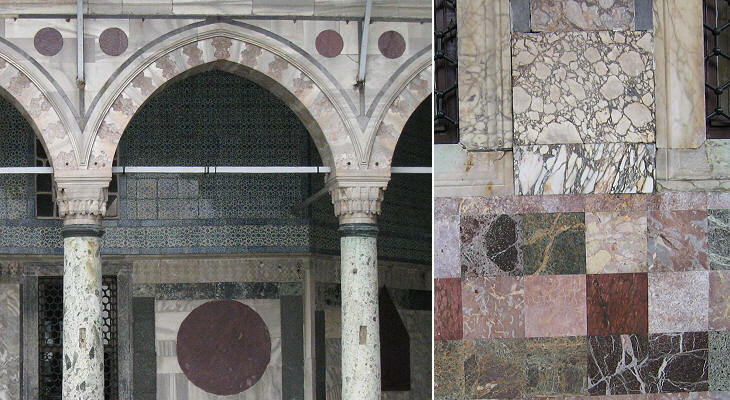 The lower part of the pavilion is faced with a variety of marbles and in particular of porphyry; there is perhaps an Italian influence in the choice of this decoration; the Ottomans, notwithstanding the many wars they waged on Venice, had a permanent colony of merchants in that city and knew its many monuments; S. Maria dei Miracoli is a Venetian church with a similar decoration. 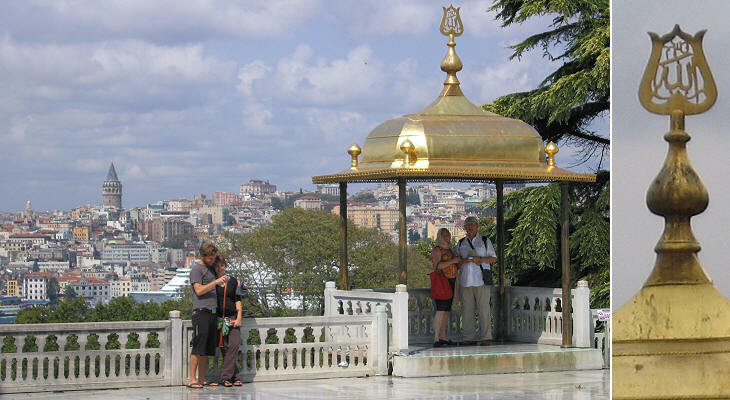 A small passage between the Revan Pavilion and the Circumcision Room leads to a terrace which commands a panoramic view over the Golden Horn. A 1640 balcony covered by a gilded bronze canopy was used by the Sultan during the Islamic month of Ramadan for taking his evening meal (iftar) which broke the daily fasting. The terrace is closed by another pavilion celebrating the 1638 conquest of Baghdad; it is similar to the Revan Pavilion not only from a design point of view; Baghdad as well as Yerevan belonged to the Ottoman Empire and was conquered by the Persians at the beginning of the century. It is uncertain whether the followers of Aristotle were called Peripatetics because they met under the colonnade (peripatoi) of the Lyceum in Athens or because they discussed philosophical matters while walking. Certainly in the ancient world walking was highly regarded: Villa Adriana was built by Emperor Hadrian mainly to allow him to walk alongside fountains and small elegant buildings. The Sultans too enjoyed walking and the last section of their residence was made up of gardens which reached on one side the Golden Horn and on the other the Sea of Marmara; today the construction of a railway and of a large coastal road have greatly reduced the size of these gardens; they also led to the pulling down of Topkapi, a gate at sea level which was protected by cannon (top in Turkish). 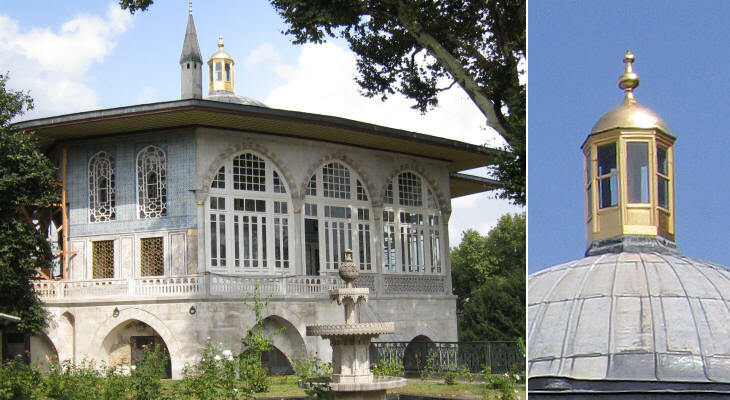 Because Constantinople is not Capri, the sultans could not walk in their gardens the whole year round; for this reason they built a wooden pavilion with very large windows where they could stay indoors and at the same time enjoy the view of their trees and beloved tulips. 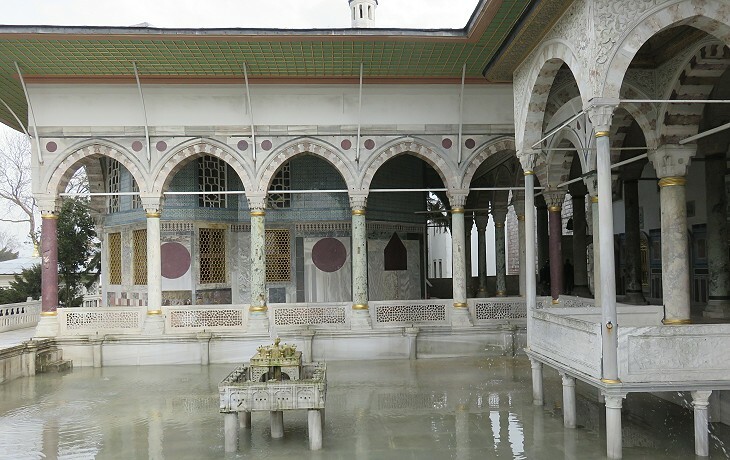 The newest structure of Topkapi Sarayi is the Mecidiye Pavilion that was built by Sultan Abdulmecit I at the eastern edge of the fourth courtyard. 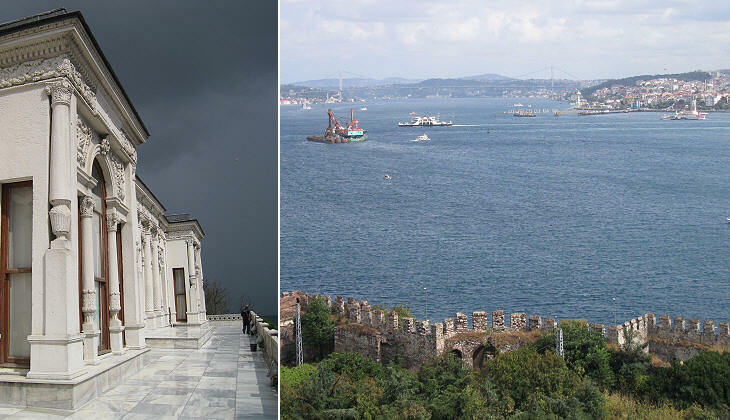 Its terrace commands a striking view over the entrance to the Bosporus (left Europe - right Asia). 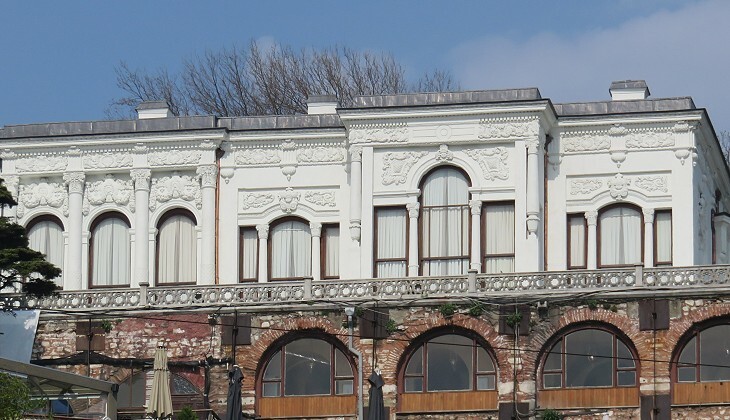 A few years later the Sultan set his residence in Dolmabahce Palace. At this point Yeni Sarayi (new palace) became meaningless and it was replaced by Topkapi Sarayi, named after the demolished sea gate (Topkapi). 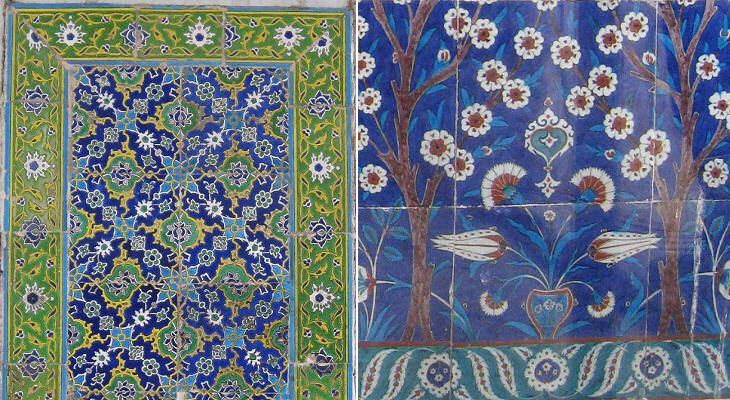 Types of traditional Ottoman tiles: (left) "cuerda seca"; (right) "Armenian boles"
The tiles used in the decoration of many pavilions of Topkapi Sarayi were often taken from prior buildings; so it is possible to see a wall decorated with tiles which belong to different periods; there are some fine examples of cuerda seca and Armenian boles (both XVIth century tiles) placed on buildings of the XVIIIth century. Overall the prevailing colour is a dark blue which in French is called turquin and in Italian turchino. Chinoiserie is a French term meaning "Chinese-esque" and it is used with reference to the adoption of Chinese patterns in European artefacts and to a lesser extent in buildings. 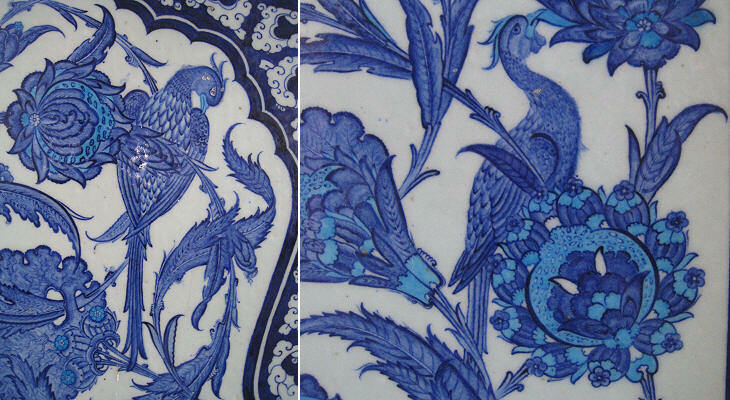 Whereas in western Europe these patterns were made known in the XVIIth century, first by the Jesuits and later on by the development of trade with China, the Ottoman Sultans were collectors of Chinese vases as far back as the XVth century and at one point the local production of tiles adopted Chinese patterns. 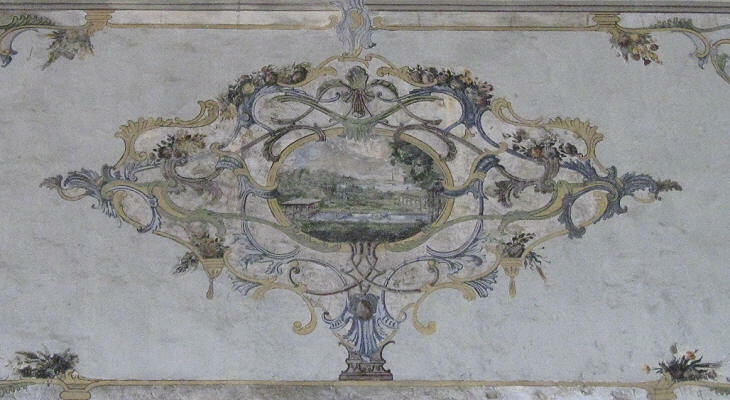 The drive towards westernization of the Ottoman Empire in the XVIIIth and XIXth century led to replacing parts of the decoration of Topkapi Sarayi with motifs and subjects which can be found in many royal residences throughout Europe. 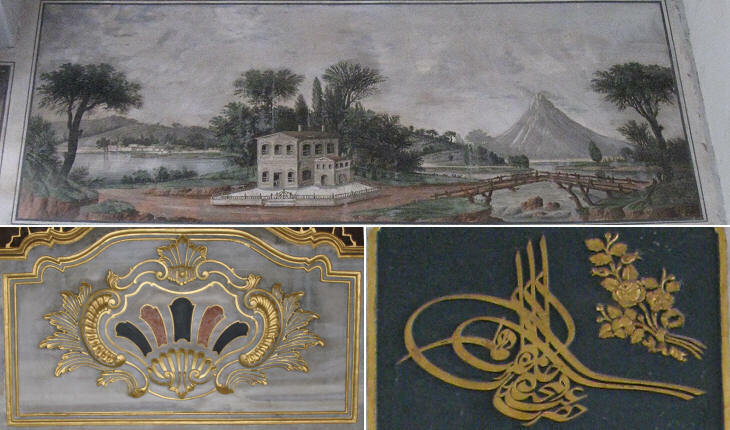 The only very Ottoman piece of decoration the Sultans did not abandon was the positioning of their tughras on the improvements/modifications they made throughout Topkapi Sarayi. A tughra is a calligraphic seal or signature of an Ottoman sultan that was affixed to all official documents and correspondence. The tughra was designed at the beginning of the sultan's reign and drawn by the court calligrapher (nisanci). The first tughra belonged to Orhan I, the second ruler of the Ottoman Empire and it evolved until it reached the classical form in the tughra of Sultan Suleyman the Magnificent. Every Ottoman sultan had his own individual tughra. The tughra has a characteristic form with loops on the left side and three vertical lines in the middle; it was not limited to the name of the sultan, but it included a sentence of praise. Return to the initial page or visit The Harem.